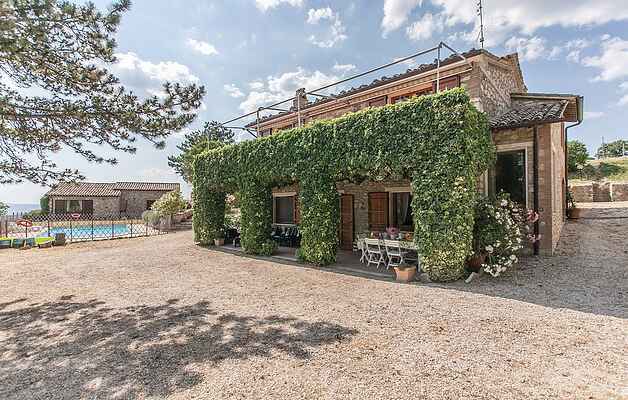 This beautiful farming estate is set in a hilly location just above Lake Corbara, with a panoramic swimming pool and surrounded by a large olive grove. The property is accessed via a gravel road (1,5 km) and consists of three houses. One house is occasionally inhabited by the owner, the other two (IUS237 and IUS238) are completely independent and equipped with a private outdoor area perfect for relaxing and outdoor dining. Inside the property there are 3 bedroom and 3 bathrooms suitbale to sleep up to 8 guests. The property is ideal for families who want to spend a holiday together while maintaining their privacy. There is also parking on the property. Upon request you can book cooking lessons, babysitting, cleaning staff and for the adventurous among us, you can try your hand at horseback riding. At about 500m you can visit the archaeological excavations of Scoppieto. The farm produces an excellent extra virgin olive oil. During the summer time, the stunning Lake Corbara offers interesting food and wine festivals. The property is located within great distances from must see attractions such as Orvieto (23km) with its stunning cathedral and beautiful old town; 26 km away is Todi with its beautiful Piazza del Popolo with ancient buildings; 36 km away is Lake Bolsena; 65 km away is Perugia with the palaces of the old town and the fascinating underground Rocca Paolina; and 80 km away is Lake Trasimeno with its romantic islands and the beautiful city of Assisi with its majestic Papal Basilica of St. Francis rich in frescoes. At about 15 km distance, at Orvieto, a railway station and motorway access will allow you to reach the wonderful art cities of Rome and Florence.